The LX Class 10 SDHC memory cards meet the latest SD Association specifications and offer a minimum sustained write speed of 10MB/s. Fast enough to record High Definition video, these LX Class 10 SDHC cards keep up with the most demanding new photography and video equipment. 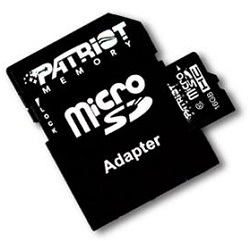 Patriot LX Class 10 SDHC memory cards offer a 5 year warranty. Remove the bottleneck of slow memory. Capture every image or video without missing a moment. Depend on the Patriot XL Class 10 SDHC card.